If you’re a runner, you already know what time of the year is rapidly coming up: race season. Late summer through early winter is the most crowded time of the year for outdoor races – presumably, the idea is that you’ll be able to train outside all summer, and then run the actual race when it’s cooled down a little so you don’t have to slog through 26.2 miles in 95-degree heat. If you’re a Paleo runner, you might be starting to gear up for a long race right about now, whether it’s a full marathon, a half, or your favorite variety of endurance-focused obstacle race. Unfortunately, most training plans for longer races (10+ miles) include some very un-Paleo nutritional advice, mostly revolving around oatmeal, whole-wheat toast, and pasta. So what’s going on here? Can you eat Paleo while training for a race? Can you carb-load on Paleo? Do you need to carb-load at all? Let’s start with an even more basic question: is endurance cardio even inside the scope of Paleo-friendly activity? Cardio isn’t bad; it’s the “more is always better” attitude. Cardio as a mode of exercise is perfectly fine. It has health benefits like any other exercise, and it’s not dangerous unless you push it to crazy extremes – in which case the problem is the crazy extreme, not the cardio. But isn’t running a marathon a crazy extreme? It’s certainly very intense. Running something like a marathon provokes an intensely inflammatory immune response. It’s also a pretty extreme cardiovascular challenge. Sudden cardiac death during marathons happens – rarely, but it happens. But on the other hand, it’s possible to recover from running a marathon. Human bodies are amazingly resilient. Your body’s antioxidant and anti-inflammatory defenses kick in immediately to handle the inflammatory response, and given enough recovery time, the cardiac stress can have a hormetic effect that makes your heart stronger in the long run. You don’t need to run marathons to be healthy. You don’t need to run at all to be healthy, if you don’t want to. For optimum health, it’s probably better to limit your marathon-running to rare events, and it’s even reasonable to say that the actual 26.2 miles you run on race day probably won’t improve your health by much (although several months of regular training runs probably will). But given appropriate training and nutrition, and enough time to recover, most people can run a marathon without doing long-term damage to their health. And then there’s the mental benefit. Finishing a challenging race can be a great experience, and there’s a lot to be said for the value of challenging yourself and pushing your limits. It’s inspirational – and it really does feel amazing to be your own inspiration. If crossing that finish line means something important to you, then lace up your running shoes and cross oatmeal off your shopping list: here’s how to prep for it, Paleo-style. The central problem here is clearly the carbs. It’s easy to get enough high-quality protein and fat on Paleo, but don’t you need carbs to fuel your long runs? And what about carb-loading? There’s actually a sizeable contingent of people who do endurance exercise on a low-carb diet: this involves an initial dip in performance but after a few weeks of fatigue during the adaptation period, performance typically perks back up again. On the other hand, if you’re more comfortable with a traditional higher-carb approach or just find it works better for you, you do have Paleo options! For short runs, you don’t need to eat anything special before, during, or after. 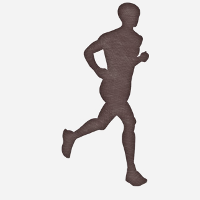 Under about 1 hour, just go for your run, and eat some starchy vegetables at your next meal. Carb-dense Paleo vegetables include sweet potatoes, white potatoes (yes, white potatoes are Paleo), and other safe starches. Another good borderline option is white rice. 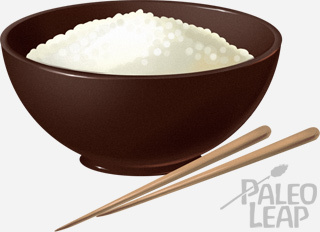 You can read all about rice here – it’s basically a micronutrient-poor carbohydrate supplement. If you’re doing runs 20 miles or longer, a carbohydrate supplement is exactly what you need, so that works out perfectly. Carb-loading is the practice of eating a very high-carb diet in the last few days before a race, to top up glycogen stores and make sure you have enough stored carbohydrates to fuel you through the race. In the past, standard practice was to deplete carbohydrate stores and eat a very high-carb diet for up to a week before the run, but more recent research has shown that this isn’t the most effective way to go. What does seem to help is a very high-carb diet the day right before the race. 7 grams of carbohydrate per kilogram of body weight seems to be the minimal helpful amount. Here’s what that looks like. In other words, you’re going to have to eat a lot of carb-dense food. It would be a lot of carb-dense food no matter how you were getting it – there’s a reason why endurance athletes have such a stereotype of plowing into bottomless bowls of pasta before a race. Carb-loading is difficult and pretty extreme no matter how you do it, and no matter what you’re eating (Juice, smoothies, and other liquid foods will be your friends here). But the point is that you absolutely can get your carbs from Paleo-friendly options if you want to. Focus on starchy foods – the point is to get more glucose, not more sugar – but fruit, fruit juice, and honey can also be helpful. Don’t give into the temptation to go for non-Paleo foods the week before the race unless you’ve been eating them all along and you’re sure they won’t upset your stomach: the very last thing you want is a stomachache or any other digestive problems on race day. During long runs, and on race day, most people do better with some kind of mid-run fuel. But if you’re facing down a wall of gross junk food in the sports nutrition aisle and wondering what on earth you’re supposed to do with that, rest assured: you’re not the first person to have this problem. For chewable energy, you can go for commercial fruit-and-nut bars (expensive but convenient) or an endless number of recipes for DIY Paleo versions like this one (Stupid Easy Paleo). Most of these are pretty high in sugar, but that’s the entire point: the goal is to get easy-to-digest carbohydrates into your body as fast as possible. For hydration, it’s also reasonably easy to DIY your own electrolyte-and-sugar drink. Here’s an explanation of why electrolytes are important with two different recipes (1 with sugar and 1 without). Running a marathon every weekend isn’t Paleo by any stretch of the imagination, but if a marathon (or a half-marathon, or any other longer race) is on your bucket list, there’s a case to be made for going for it, as long as you’re training and recovering properly. And yes, you can run a Paleo endurance race. Whether you want to try a walk on the low-carb side or whether you want to stick to a more traditional higher-carb training diet but use Paleo food, there are plenty of options that don’t involve whole-wheat toast with peanut butter!